Elisabeth Elliot has felt the deep pain of loneliness. 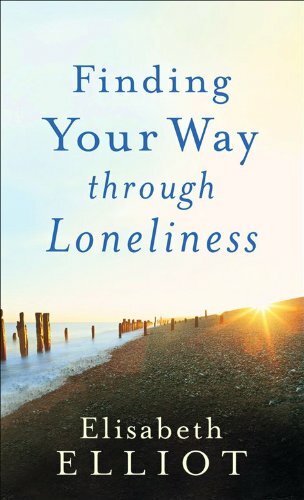 In Finding Your Way through Loneliness, Elliot gives hope to the lonely through tender reflections on God's love for us and his plans to bless us. She tackles this difficult topic with grace and faith, showing readers how to make peace with loneliness and grow through it. Elisabeth Elliot has felt the deep pain of loneliness, just like you. In Finding Your Way through Loneliness, she gives hope to the lonely through tender reflections on God's love for us and his plans to bless us. Here you will find honesty and compassion, not platitudes. She tackles this difficult topic with grace and faith, showing you how to make peace with loneliness, however it has come about, and how to grow through it. Elisabeth Elliot, one of the outstanding women of present-day Christianity, is the author of more than twenty books, including Passion and Purity, The Journals of Jim Elliot, and These Strange Ashes. She and her husband, Lars Gren, live in Massachusetts.